Over the weekend, the East track team hosted the Pan-Ram Invitational where there over 1500 athletes that competed from more than 30 schools. Both girls and boys walked away with titles. The girls team placed second overall. Medal winners were Makenna Krebs-1st in Mile, 2nd in 800, Delaney Line-3rd in 800, Trinity Bellamy-Reid-3rd in 400, Chanise Jordan in hurdles, Taja Colbert in 100, Relay teams of Taja, Markya Wallace, Ajanae Carroll, Trinity, Delaney and Makenna. On the boys side, Emmanuel Niang won the 110 hurdles and is now PA #1, He also won the Long Jump. Stephon Brown won the 400 breaking the meet record and is PA#2, Shawn Brown won and broke the meet record in the 100, PA #1. The boys relay of Bryce Baker, David Niang, Stephon and Shawn took first, broke the meet record missed the state record by .003 hundredths of a second becoming current PA #1 are PA All time # 3. Josh Kimotho, Moses Kimotho, Quinton Smith, Jason Konadu contributed points and medaled in the 4x800 relay. Last but not least, the meet would come down to the the boys relay of Jason Konadu, David, Stephon and Shawn which won and sealed the boys team title. The Boys Varsity Volleyball Team took their 2nd tournament vistory this weekend in Elizabethtown. Congratulations to the boys! Below is the East High School Emergency Plan, a simple guide for parents of what to have ready, and what to do and not to do, in the event of an emergency at Central Dauphin East High School. The Central Dauphin School District initiated a random drug testing policy for student athletes beginning with the fall season of the 2017-2018 school year. Click HERE to access the CDSD Parent Information Sheet and the Drug Testing Permission Form. 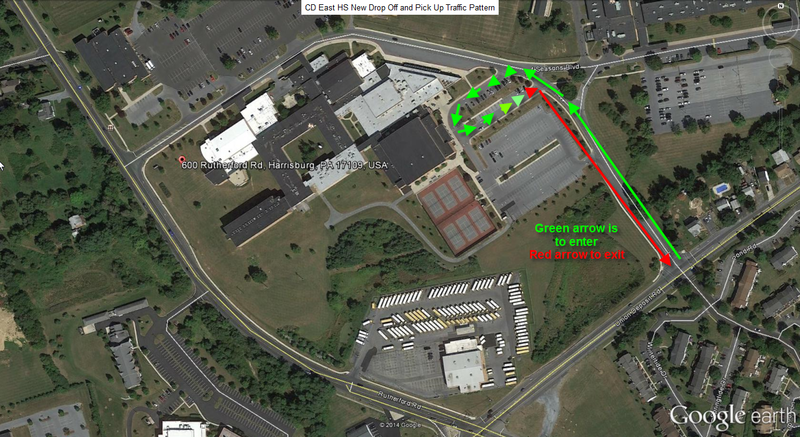 For the purposes of enhancing vehicle and pedestrian safety on the campus of Central Dauphin East High School, student drop off/pick up procedures are in effect during the time periods of 7:00 a.m. – 7:45 a.m. and 2:00 p.m. – 2:45 p.m ONLY. The drop off/pick up location for students is at the gymnasium entrance in the back of the school. Vehicles should enter via Union Deposit Road and travel up to the very top of the parking lot (where the first bus is parked) and make a left into the lot and follow it down to the gymnasium to drop off/pick up students. There will be signs marked Student Drop Off/Pick Up with arrows indicating traffic pattern. Click HERE to access a map of the new traffic pattern. You enter via Rutherford Road, you are not be permitted to drop off or pick up your student at the front entrance, you will need to keep moving to the back of the school. This entrance is designated for bus loading and unloading during these time periods. Lower Paxton Township Police will take the appropriate enforcement action as necessary. Please exercise caution when driving in this area, as our student drivers utilize the bottom half of the parking lot closest to Union Deposit Road. Thank you in advance for your cooperation to ensure the safety of our students, staff and visitors to the campus.